After your braces are put in place and any routine adjustments are complete, you are likely to feel some temporary pain, soreness and discomfort. This will diminish after about a week. However, before you can start enjoying some of the foods you love, you will need to know how to eat with braces to avoid the foods that could damage your new appliances. 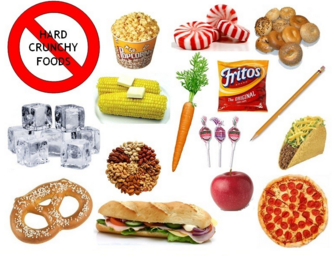 Eating foods the way you're used to could cause brackets to come off your teeth or break altogether. 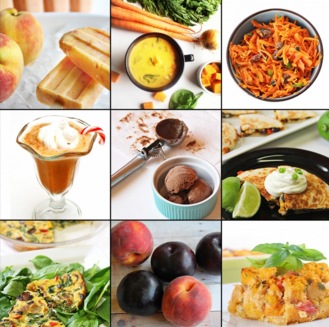 Learning how to eat with braces doesn’t mean you have to give up on the foods you like. For example, if you love corn on the cob simply use a knife to cut corn kernels off the cob. Cut apples into slices before eating, instead of biting and pulling with your front teeth, and a good way to avoid any damage is by cutting all your food into smaller pieces. When you've recently had braces put on, chew with your back teeth. They are better suited for grinding food, and may help alleviate the pain your front teeth might be feeling. It can be helpful to physically put the food in the back of your mouth. If you're not used to using a fork to place food in the back of your mouth, try placing the food pieces into the back of your mouth using your fingers. Eating too quickly could cause you to forget how to eat with braces such as eating smaller pieces, and chewing with your back teeth. If you eat too quickly, you may also risk biting into pits, seeds, or bones. Drink plenty of water while you’re eating. This makes swallowing easier if you're having a hard time chewing. 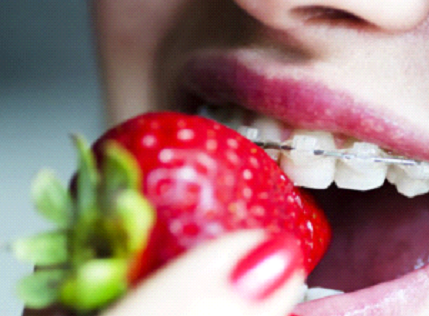 Drinking water also helps rinse away any food residue that may get caught in your braces. The most common way to reduce inflammation in your mouth is by rinsing with a saline solution made from a teaspoon of salt and eight ounces of clean, warm water. Rinse with the saline solution as often as necessary, but especially for the first week after an installation or adjustment. Some people may experience discomfort from the metal on the braces as it rubs the flesh, while others may have to deal with a protruding wire, the remedy is to apply orthodontic wax on the wires and appliances. Orthodontic wax helps you adjust to the metal braces that are causing the discomfort and pain. However, if you have a broken bracket or a poking wire, it's best to see your orthodontist as soon as possible. Use a toothbrush with soft bristles and a small strip of fluoride toothpaste. When you brush your teeth, move the brush in small circular motions and brush carefully and slowly, covering all areas between braces, between teeth, including the surface of each tooth. Brush down on the upper teeth and up on the lower teeth, and remember to brush your tongue and the roof of your mouth before rinsing. Remember to replace your toothbrush with a new one as soon as the bristles start to wear down. Flossing will take more time and patience when you are wearing braces. Be careful around your arch wire and do not floss too hard around it or put a lot of pressure on it. After you floss between your braces, floss between your other teeth and gums and behind all of your back teeth. Floss at night to ensure your teeth are clean before bedtime. Take note that when you first begin flossing around your braces, your gums may bleed a little. If the bleeding does not stop after the first few times, inform your orthodontist at your next appointment.